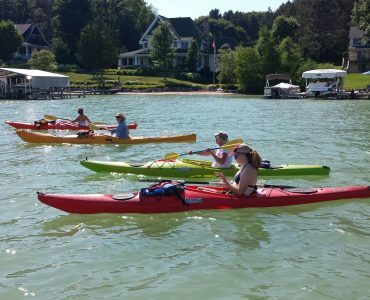 A team of adult men and women who enjoy the sport of recreational kayaking will tour 30 miles of shoreline around Walloon Lake led by Karen Marietti, director of the Camp Daggett Adventure Center (CDAC). The proceeds will support CDAC programming for youth. The Kayak event will be begin at 8:30 a.m. at Bear Cove Marina on Saturday, ending that day at around 4:00 p.m. The team will proceed around the lake on Sunday morning at 9:30 a.m, ending up back at Bear Cove Marina around 1:30 p.m.
For more information, contact Karen Marietti at 231-347-9742 ext. 117 or karen.marietti@campdaggett.org. Again in 2019, you will be able to purchase a dock flag, make a donation or support a kayaker.